This is a novel not about the end of the world, but about what comes next. We start in the present day, when a famous actor called Arthur Leander is playing King Lear in an innovative new production. Halfway through the play, Arthur has a heart attack. The first person who realises what's going on when he starts to mess up his lines is Jeevan Chaudhary, an audience member who's training to be an EMT. Jeevan charges onto the stage and performs CPR, but can't save Arthur's life. Everyone's in shock and no one realises one of the child actresses, Kristen Raymonde, is still there watching it all. That's the very night when the Georgia Flu begins its final spread. A sick passenger leaves its area of origin in the former Soviet republic and infects everyone on the same flight, and through them, people all around the world. This particular flue is airborne, extremely contagious and fast-acting, and kills over 99% of those who get it. It ends the world as we know it. Twenty years later, we meet Kirsten Raymonde again. She's still an actress, now part of the Traveling Symphony. The Symphony is a group of actors and musicians who travel around the small settlements of survivors that remain in the area round the Great Lakes, specialising in Shakespeare's plays. And the action moves back and forth, as we follow the Traveling Symphony, then move onto the lives of people somehow connected to Arthur Leander, before and after the flu swept the planet. I loved this book. I loved it because it's not your typical post-apocalyptic setting, where it's all violence and the strong abusing the weak. It's made clear that there was violence and fear at first, but in the last 5-10 years, things have got much more peaceful. People are getting on with living the best lives they can live, and travellers can expect a good reception in most towns. They might even expect a cautious welcome when coming upon an isolated dwelling, whereas we're told in the early days, the people there would have shot first and asked questions later. There are still exceptions, like a town they go through where a crackpot preacher has taken over, taking every woman and girl he fancies as his wives, but mostly people are good. What surprised me the most, for a book that's basically killed over 99% of the Earth's population, is how hopeful it made me feel about humanity. It's strange, because it's also a book that's tinged with sadness and with a strong sense of loss. That sense of loss is for the people who died, but there's also a surprisingly strong grief for the world that has been lost, for a way of life whose relics the survivors can still see all around them. People can still remember a world where an infected scratch didn't pose a serious risk of death, but also a world where the light turned on when they flipped a switch, where they could speak to anyone anywhere in the world just by pressing a button and where warm air came out of ducts in buildings. It seems prosaic, but it felt true that people would mourn for that loss as well, and that those who were born after the collapse, or only a bit before it, would think of such things as computers as almost mythical. And that's where the hopefulness comes in: this is a book that says that our world and our humanity today are valuable, and that we would and should mourn if they were lost. I also loved the structure of the book. The best way I can describe it is that the narrative starts out flying overhead and zooms in to focus on a particular character at a particular time, before zooming out again and going for someone, sometime else. At the beginning you can't really understand why we are seeing pre-collapse scenes of particular characters, but the connections come through later and make everything make sense. The structure helps us see the macro as well as the micro, but the focus on characters makes us really feel the significance and impact of the big things. And Mandel's occasional use of an omniscient point of view is truly arresting. 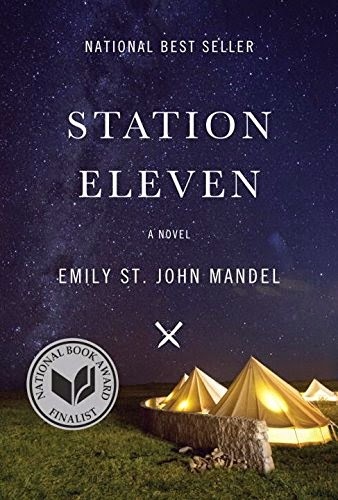 I highly recommend Station Eleven. A week after finishing it, random images from it still haunt me. Now I'm all excited to find and read this book. I can't remember the last time you said you loved a book, not with this kind of enthusiasm. Can't wait. :) Yeah, these last few weeks I've reviewed a lot of 'meh' books. I hope you enjoy it! I kind of feel like this is the book that Midwinterblood tried to be -- the different but connected narratives, and all of those connections fit together so much better and added more to the story. Anyway, I got it because of this review, and very glad I did. It really is so much different from the typical post-apocalyptic book (which I love, but they do sort of run together). That did have the violence and I can't really say it was upbeat (or that I particularly liked some of it) but still fascinating in a can't-put-down way, and a wonderfully different approach to the apocalypse. Now I have to go make sure that's the right title. Yes -- The Reapers are the Angels by Alden Bell. At time the prose is dreamlike and poetic, and the imagery really beautiful. But, yeah. Definitely not real hopeful about the human race. Meljean: Agreed. When the different threads started coming together, it felt really satisfying. And it also explained why we had seen particular scenes earlier, which felt unconnected. I'm very glad you enjoyed it. I love the bleaker kind of post-apocalyptic fiction as well, but it was nice to have something quite different.